Buy the Farm . . . Share: Everything Must Go! Friday and Saturday of this week were strictly devoted to the making of foods to clear out our pantry, freezer, and fridge. This all culminated with last night's party to rid ourselves of as much food and drink as possible. We intended to also get rid of as much of our unneeded clothing, electronics, and other assorted items as well but kind of forgot. Therefore Good Will will be getting a large drop off early next week. 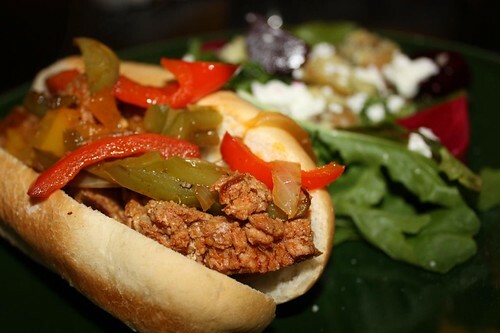 Friday I thawed out some frozen chorizo and made a sausage and pepper variation with remaining rolls from the freezer. I also made a salad from the beet greens, arugula, and red leaf lettuce from the farm along with some beets and dill potatoes. Another thing that's been clogging up the pantry for some time was a big old bag of garbanzo bean flour. 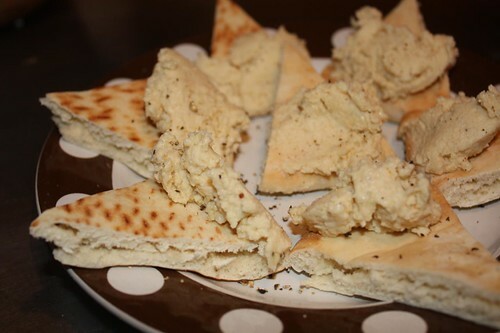 With that I made some hummus. I actually made a giant batch of hummus. It might be like a gallon of hummus. We had people over last night and all I had out was hummus and there's still about 98% of it left. So we may be "enjoying" hummus frequently until we move. This morning we woke up early and took a rainy drive up to Westchester to sign the lease on our new apartment. To celebrate the move to suburbia we had lunch at P.F. Chang's, one of Westchester's myriad Asian fusion type restaurants. It appears that Westchester is a bit stuck in the mid-to-late 1990's as far as restaurants go. Luckily it doesn't extend to music so we will be spared infinite loops of Rob Thomas songs. 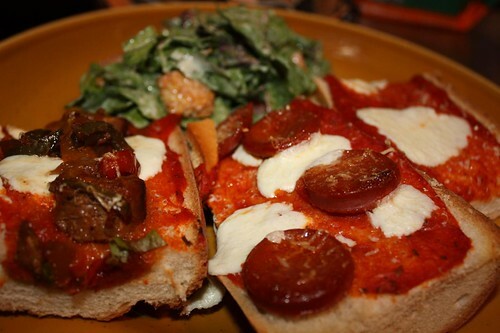 Tonight we used a leftover baguette, pizza sauce, mozzarella, sausage and peppers to make these French bread pizzas. We also used the leftover beet greens, arugula, and red leaf along with grape tomatoes to make a Caesar salad that may not have worked all that well. For dessert I made a graham cracker crust with a little butter and some Lyle's Golden Syrup. 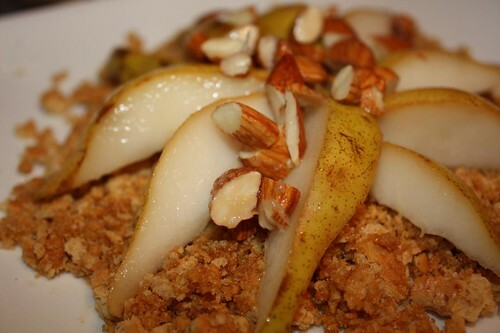 I also soaked some pear slices in brandy, Amaretto, and chopped almonds to top the crust. The result of all of this nonsense is now we have slightly less to move! A large bottle of Fish Eye Shiraz. A jar of pizza sauce. Hooray for making lame meals!